William Smith, the ‘father of English geology’, is famous for creating the first geological map of a country – the ‘Map that changed the world.’ One of his famous geological maps of England and Wales now hangs in our entrance hall at Burlington House, where visitors still flock to see it. But what did he do next? 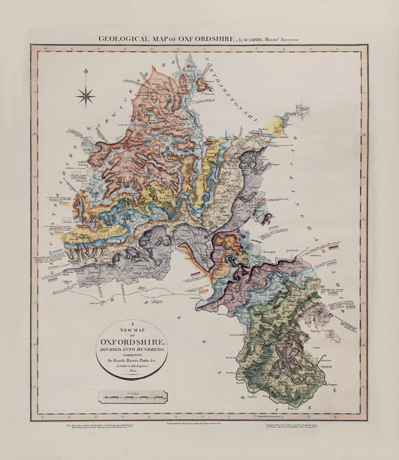 After Smith published his famous geological map of England and Wales in 1815, he embarked on two other illustrative projects incorporating his ever-developing knowledge of the geology of the country around him. One of these projects was his geological cross-sections, the other was a set of atlases containing maps of English and Welsh counties. These two projects were both large, expensive and almost entirely self-funded. Ultimately, they were to cost Smith dear, resulting in a spell in debtors’ jail. In the case of the county maps, the project was never completed. John Cary was a famous English cartographer, producing from 1787 what was to become one of the standard references for mapping of England. Cary’s ‘New and Correct English Atlas’ was published in atlases of four counties at a time over a period of years. 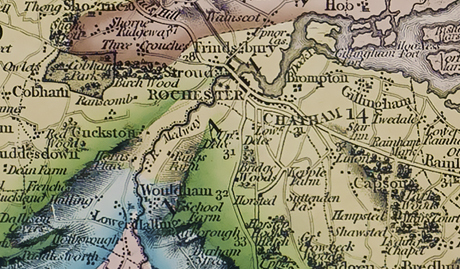 His first collaboration with William Smith was on the 1815 map . He produced the engraved plates, marked with Smith’s geology. Once printed, the maps were coloured by his employees under Smith’s direction. Once complete, the maps were published and sold by him. 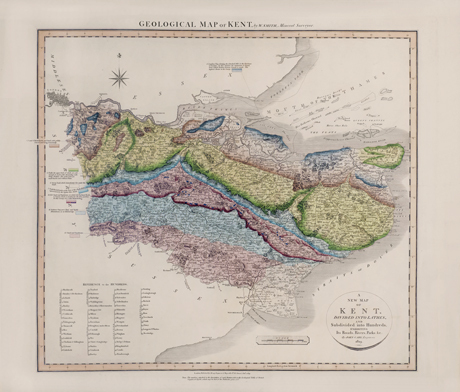 It was only natural that Cary and Smith would go on to produce geologically coloured maps of English counties in the style of Cary’s earlier topographic maps. The format was the same – atlases published at regular intervals with four counties in each. Each county had to be engraved afresh with both Cary’s latest mapping and with Smith’s most up-to-date geology. They were then coloured extensively. As a comparison, you can view Cary’s map of Kent online . Compare that with Smith’s geological version at the top of the page. They’re beautiful objects, combining the classic 19th cartographic style of Cary with Smith’s geological colouring. Where the strata gather together, a rainbow of colours overlays the familiar county topography. The first atlas was published in January 1819, with subsequent atlases following later the same year, then in 1820, 1821 and 1822, with the final volume in 1824. By then the money had run out, and William Smith had left London for Yorkshire. He published very few other works during the rest of this life. Cary did go on to publish three further counties with geologically engraved plates, but they were uncoloured. Those six atlases covered 21 counties, with Yorkshire being published on four separate sheets in its own volume. Smith had begun work on further counties including Northamptonshire, Monmouthshire, Cambridgeshire and Staffordshire. The William Smith archive at Oxford University has photographed some of these maps from Smith’s own collection in different stages of completion, some with extensive notes by Smith himself. The Geological Society has a bound atlas of all the published maps to 1824 (excluding the three published by Cary uncoloured). These have been photographed by the Royal Geographical Society and digitally cleaned, meaning that we can produce prints of each of these maps for the first time. Please visit our website for further information and to see the maps. Tags: art, geography, geology, history, John Cary, maps, William Smith. Bookmark the permalink. Previous post ← Contamination – How the ‘C’ word can put the fear into anyone. This is great, thanks for sharing this. William Smith is really a smart one.